Meet Havana and Hopje who are sisters and almost 16 years old. Born in Menton, they now live in the beautiful medieval village of Roquebrune with their breeder, Marie-Hélène, who is a Dutch artist and friend. She is a wonderful source of information on Menton and Roquebrune and often helps me with details of history for Menton Daily Photo. 'Havana and Hopje had a brother, Hector, who died last December. Their mother was Dufy de Jouxte Boulleng (died 1998) who endured a nuptial ceremony with their father Drill von der Domerhogte in Cabris, near Grasse, early 1992. 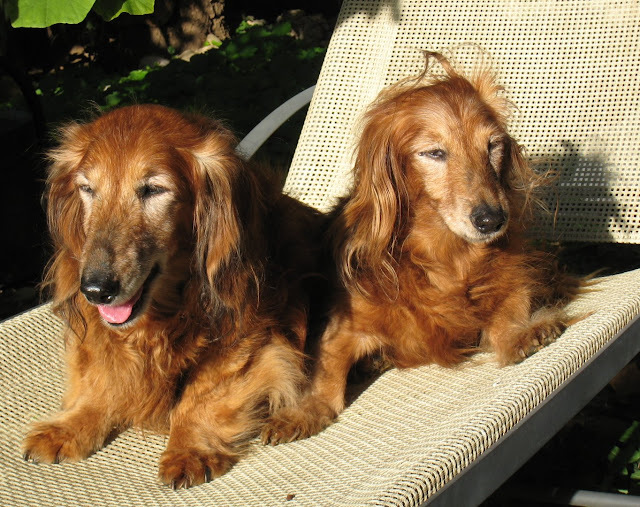 Their great-grandfather was a well-known long-haired dachshund champion called Richter de Jouxte Boulleng, bred by M et Mme Caron from Normandy (now retired) . 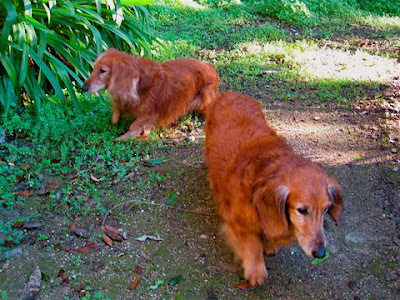 In the French dachshund world there is a notion of "la tête de Caron", something about the head which makes them instantly recognizable as descendants of one of the Carons' dogs. I have been stopped in the street by people asking me if they were from "chez Caron". Once at the small airport of Mandelieu, near Cannes, where I went to pick up little Hopje who had made the journey there by herself in a six-seater plane from Switzerland, I saw a dog with a definite "tête de Caron" and he turned out to be their cousin ! Another time in Cannes I passed a dog who had that same lovely head and he also came from Caron. Havana has been with me since birth. Hopje spent a few years in Switzerland and then ten years in the Hague in Holland. Nearly two years ago she decided to retire to the French Riviera and come back to live with Havana and me. This has been a great success, with the two sisters behaving like a trade union when it comes to food, Bonios etc.. They are the best of friends (I have about 5000 photos of them sleeping with one head on the other's shoulder etc.) and still enjoy the lascivious attention of one or two male dogs, particularly a smooth-haired dachsie from Turin by the name of Gothic, who has always been passionately in love with Havana and now also courts Hopje. What a lovely pair and I have to ask for I am a great perfume lover ( see I don't just love dogs) are the Caron's related to the famous caron perfume house ? Lady Jicky - I asked but apparently there was no connection with the perfume house. However, as it's been raining in Roquebrune for two solid days and the two old sisters got very wet, I've been told they smell rather bad and could do with some scent! Oh dear - doggy smell! Better get a huge bottle of Caron Perfume for those two! A few years ago a scent was created especially for dogs. It is called "Oh my Dog" and comes in a beautiful bottle. No idea what it smells like, though.